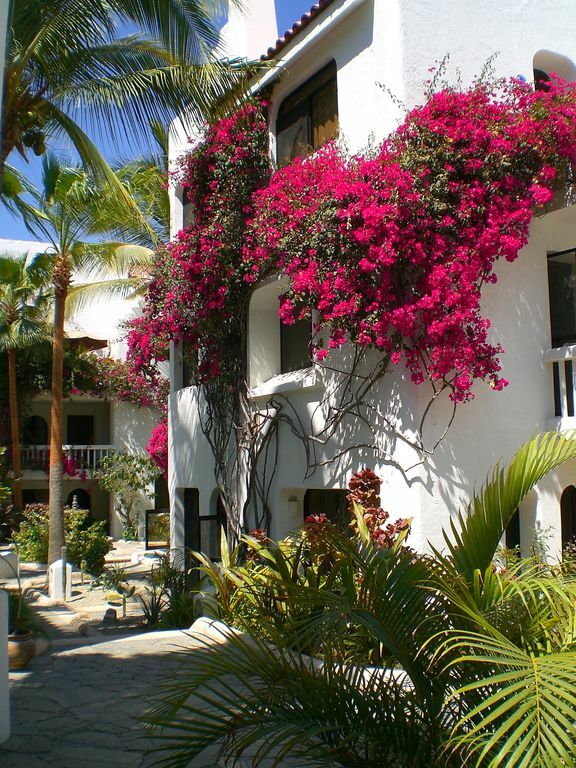 'Villas Baja' is a Spanish style three-story complex with 29 privately owned townhouse style condos. Many colored bougainvilleas drape from the upper floors to cover most of the building. The grounds are exceptionally well kept with many native flowers and trees. The complex is situated on the first green of the Mayan Golf Course and is only minutes to the beautifully uncrowded beach and the Sea of Cortez. My unit is on the ground floor (no high steps to climb) and is approximately 915 square feet. This unit is at the end of the building and is very private. The patio faces an expanse of trees and lawn. The living room bay-window is framed with bougainvilleas looking over the golf course. A sparkling fountain can be heard near by. The patio is accessible from both the living room and the large master bedroom where there is a charcoal BBQ and patio furniture. The red Mexican tile adds flavor and authenticity to the surroundings. The large master bedroom has just been redecorated with hand-made native Mexican furniture and original art work. The bathroom has a new Mexican tile make-up arm with a hand painted blue and white sink that lends itself to ease and comfort. A glass block tub-shower is large enough for more then one. Showering is almost like a spa experience. A wicker basket holds warm plush royal blue and bright yellow towels. Just added is an enclosed medicine storage cabinet for personal items. You will enjoy the newly decorated living/dining room with bright Mexican colors that welcomes you. The walls are decorated with original Mexican artwork from the local artisans of San Jose. A wine rack with hand-blown glassware is waiting for your special wine or margaritas. The pool area has a beautiful rock inlaid heated swimming pool. A foot bridge bisects the shallow end from the deep end. This is one of the only heated pools in the area. It is kept at a wonderful even temperature. Between the pool areas is a covered palapa that can be used for entertaining. A public BBQ is on an elevated area that overlooks the lush Mayan Golf Course. Everything is so accessible from this complex, a car is not needed unless you plan an excursion to Cabo San Lucas which is only 18 miles to the South. A Mega Store Complex is a short walk away with groceries, excellent restaurants, phones, Internet Cafe, dress shops and fast food. A bus travels frequently to the historic town of San Jose where there are numerous shops, restaurants and entertainment. The beach in San Jose is so beautiful. The Sea of Cortez offers some awesome activities. A short walk takes you to 'Message on the Beach' and further along, to rental of water toys. Horses for rent parade down the sand, turtles hatch their young and vendors sport their wares. Walking down the beach will offer many wonderful sights and places to eat. My condo has a guest book that gives more information. Close to 'Villas Baja' and down the street is 'El Patio' restaurant that will cater your party or serve a delicious meal to your doorstep. A short walk to 'El Patio' and an evening in the open-air restaurant will be a rewarding experience with their superb Mexican cuisine. Fishing is outstanding. In my condo I have outlined places to go and see. In Cabo San Lucas the marlin fishing is world renown. San Jose hascompleted a new marina. Many fisherman will entice you to their pangas for a day of tuna fishing. The catches are overwhelming and many have to be returned to the sea, but there is always enough to take home or to saute in the condo's fully equipped kitchen. Between San Jose Del Cabo and (The Corridor) Cabo San Lucas is a variety of outstanding golf courses. There is also several beaches that boast some of the best snorkeling in the area. The 'corridor' has many things to see, such as the Glass Factory, a must. There is bus service, taxi or rental cars nearby. Of all your travels, this area is a must to see. My condo is beautiful, inexpensive and I would love to have you as my guest. If there is any special occasions, I will be happy to accommodate your needs. Thank you for viewing this rental. I am retired and wanted a condo by the Sea. I do not like large complexes with hundreds of people. I knew a friend that bought a unit in San Jose and thought it was a beautiful place. I rented her unit and fell in love with the small Spanish style, three story condo complex. The convenience to the nearby beach, golf course and shopping; made this unit just perfect for me. The people who own are very friendly and I enjoy escaping to the sunshine during the long winters at home. The weather in the Baja is perfect. During the season it is between 73 and 83 degrees and the humidity is low. The breezes blow during the early season and the sun shines almost all the time. I think I have only seen half a dozen cloudy days. The people are friendly and welcoming. The restaurants are wonderful and the entertainment is abundant. large garden style bathtub/shower. Make up area and storage closet. Short walk to the public beach. Approximately, 2 miles to downtown San Jose along Hotel row. The front bay window and the patio view the expansive lawn and the Mayan Golf Course. Central Thermostatically Controlled. Additional $100.00 per month to acquire a key. Separate linens provided for sofa-bed with extra cleaning fee charged. Shared at laundry room within the complex. Key available in the condo. Shared at laundry room within the complex. trays, BBQ utensils, dish towels, pot holders, etc. plenty of needed utensils, dishes, glasses. Cds are available in the unit. a car is not needed to access shopping, dining, beach and wildlife area. A short walk to downtown San Jose is a must. Bus service to town and also to Cabo San Lucas, 18 miles South. We arrived in the evening and had no trouble finding the property. It is an older traditional unit but was clean and fully equipped. The location was perfect for us. Walking distance to the grocery store, shopping and many excellent restaurants. Bed was comfortable and it was nice to have some english TV available in the evening or while having breakfast. The unit did not have Wi Fi which was a bit of an inconvenience but it was available at pool side. The unit has a delicate flushing system that could be a problem if you weren't careful. The other condo dwellers made us feel welcome and we spent many hours around the lovely pool visiting and catching the sun. We would definitely rent this unit again. We enjoyed our stay in San Jose at Cheryl’s condo. Cool and comfy. Location fabulous, Walking distance to all the amenities. Pool was lovely, great folks all around but also respectful of privacy. Cheryl was a responsive accommodating host. Easy to contact and very helpful. We enjoyed our stay in San Jose. The condo is clean and had everything we needed for our week-long stay. There was no bottled water in the condo, as promised, but the grocery store is just across the street. It's a short walk to the beach and a few restaurants. Downtown is about a 30 minute walk or a quick, inexpensive bus ride. The pool area is nice, and all of the people in the complex were friendly. Our only complaint was with the booking process and time leading up to our stay. If you stay in the winter, you won't need air conditioning, but the "optional" air conditioning usage fee is automatically included in the booking cost. I asked Cheryl about it, and she said she removed the fee, but we were still charged. She told me she contacted VRBO, and there is not a way on the VRBO system to refund a guest, so she would mail a personal check. This seemed a bit backwards to me, so I reached out to VRBO myself, to find out that you absolutely CAN refund a guest through the system, and they would send Cheryl instructions. We also had to call Cheryl for the code to the lockbox, because she wouldn't send it over VRBO. None of this is a huge deal - just a bit of a hassle and takes away from the convenience of booking through a system like VRBO. I immediately requested the a/c refund and was assured by VRBO that it was taken care of. I don't feel me or my condo should be penalized for VRBO's procedures, this is nothing I have control over. I am able to book a rental in my unit without going through any web site. As far as the lock box is concerned, this is access to the condo and I have no intention of putting this information out for everyone to see. I am diligent about quickly replying to an requests or problems. Beautiful complex and very comfortable condo,. Wow, what an exciting and fun filled vacation. Thank you Cheryl for sharing your rental. The location of your "Villa" is so perfect that a car is not necessary. Easy access to LaComer for grocery shopping and a great walk DT San Jose for restaurants. The artwalk on Thursdays is lots of fun. A trip or two to San Lucas by bus is very easy and inexpensive. Would recommend: Cabo, Wabo, Giggling Marlin, and El Squid Roe for lots of fun. Favorite restaurants include: Habenero's, Tropicana, Cynthia's, Retro, Shooters, C.J. 's, Chilitepenio's, and, the Container at San Jose Marina. You made our trip a vacation full of memories with lots of sunshine!! I so appreciate your glowing review. I especially like the way you highlighted your favorite spots. Thanks again for staying with me. We just came back from almost 4 months at Villas Baja. This unit has all the comforts of home, from coffee maker to microwave. The location is excellent. You can walk to the centre of town, restaurants, and major grocery store. Short walk to the beach. Short drive to other beautiful beaches, such as Palmilla. Very nice private patio. Excellent value. Would recommend this property to friends and family. I tried to rent it for my friends for next year but a portion of the dates weren't available. Book early for longer stays. A nice complex with a mix of Canadians and Americans. Rentals are not available from June through September. six month advance reservations require 1/2 rental fee paid at time of booking non-refundable. Rental agreement required to be signed on VRBO Contact owner for monthly rates, and three night minimum rates.